eLeague is one of the biggest professional eSports organizations out there. As you may already know, it has been formed in partnership between Turner and WME | IMG, two of the biggest names in the industry, and as such it deserves great respect when forming eSports events of this scale. The first season finished with a proper blast when the polish team Virtus.Pro defeated the favorites – Fanatic 2 – 0 in what was one of the best matches of the entire last season. eLeague Season Two preliminary rounds are going to start on Wednesday, September 7th. After the preliminary rounds, there is going to be a 4-week long group stage during which teams will battle against each other to prove their worth and grab the first spot in their group. This is an archived CS:GO league! There are going to be a total of 15 people monitoring each step of the eLeague – from analysts, observers, commentators, interviewers, and hosts. The first 8 teams that will be competing in the main tournament are already known. They managed to claim their spots during eLeague's season 1, where all teams that managed to get to the playoffs earned the right to compete directly from the group stage of eLeague Season Two. In addition to those teams, all others which participated in season one have been invited to the preliminary round in which they will have to compete to claim their spot in the main event – starting from the group stages. All things considered – this looks like it is going to be a real CS: GO spectacle. If you love to bet on eSport matches, then this portion of our article is the best for you. 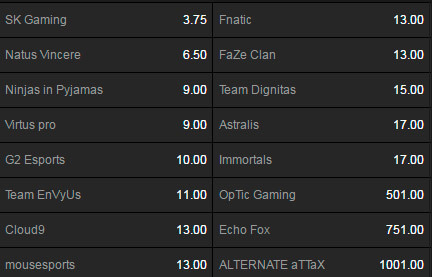 Considering the fact that there is still a lot of time before the start of the main tournament, there are not yet any details on the odds on various CS:GO betting sites. This portion of our article is going to be updated when the time comes. Make sure you stay tuned so you do not miss out on anything important. 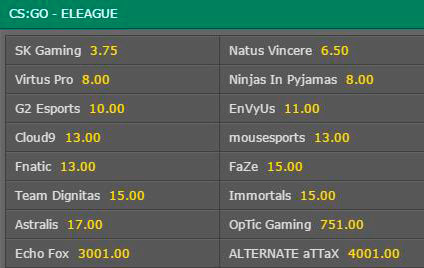 Bet365 and Betway have released their eLeague Season 2 CS: GO odds and you can see them down below. In addition to the regular match winners, they both feature a bunch of special bets such as group winners, pistol round wins and, of course, outright competition winners. Let's compare the outright winners on both pages and see how they stand agaisnt each other. As it was already stated above, eLeague Season Two is going to be broadcasted live on cable television. In addition to this, organizers of season two have made a partnership with Twitch.tv. This means that the entire event (including the preliminary matches) is going to be streamed live on Twitch.tv, featuring a huge amount of broadcasters and host that are bound to make the entire even that more interesting.